It's the end of the month and time to say 'Goodbye to May 2016', and it turned out to be a very unusual May month. The first 3 weeks we had terrific weather, as part of the heatwave that embraced Thailand, we had lovely weather and many people actually thought it was too hot. Until the 19th May it stayed dry like a cork for almost 6 weeks in a row and much needed rain was welcomed that day. Now we had a storm pattern covering almost the whole of the South East Asian area, which affected Koh Samui, with some very strong but short storm like wind gusts, accompanied by some rain. All in all the wind and storm like conditions turned out to be not anywhere near as bad or as strong as predicted but the wind blew long and hard enough to affect small boat traffic. This caused among other dive and snorkel boats having to cancel their trips and for the ones who didn't cancel, there was a lesson to be learned on 26th May when one speed boat capsized and four out of 36 people drowned. There was also a big fire raging near the Chaweng Makro and shooting range area on the ring road in Bophud, when rubbish being burned was spread by the wind and the flames were reaching higher than the coconut trees. Luckily nobody got injured and no houses were damaged. The last couple of days the weather has been improving again and the wind has almost completely run out of air. It's sunny and the start of June should be just fine and sunny. Now it looks like I will be home for all of June, with a visit of my sister coming up and this coming weekend the Cancer Care run on Saturday 4th June and the Samui Green Market on Sunday 5th June. The forecast sees the clouds moving out by tomorrow morning and we should have nice and sunny days ahead of us with a very slim chance of rain and if at all, nothing more than a tropical shower. The forecast is looking good again for the next ten days, the wind should be more or less gone and come Wednesday, the sun should break trhough again and we have a couple of nice and sunny days. There are very slim chances of rain over the enxt ten days, at best a tropical shower. Enjoy! This morning I am in Hat Yai under a mostly cloudy sky with a current temp at 10am of 30.2C I participcated in the 10th Internation Hat Yai marathon and I ran the half marathon. For more info, see my proud picture below. I got down here by bus and am taking the 11.30am bus back to Koh Samui. 10th Hat Yai International Marathon, I participated in the half marathon and ran a new personal best, 21.21km in 1:47'56 and placed 5th in my age category, in a strong field. Hapy days down on Hat Yai! The forecast the last bits of wind and clouds going into today and this night with the sun popping out again afte tomorrow. I don't expect any rain either, it's sunny times again in the making. Enjoy! A very early weather udate today because I'm leaving for Hat Yai by bus, where I'm planning to run a half marathon tomorrow morning. It's been a very long time since I travelled by bus in Thailand. The forecast predicts one last peak of strong wind come tomorrow afternoon and by Wednesday the sun should be back again, We also should have seen pretty much the last of the rain for the coming next ten days. 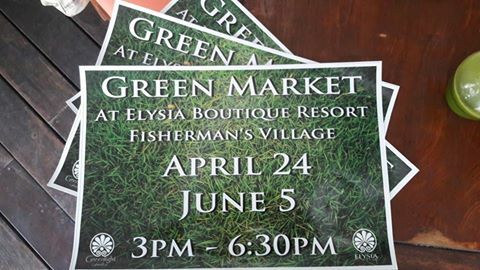 It's that time of the month again and it's time for the next Samui Green Market will be on 5th June @ Elysia, Fisherman's Village which is a Sunday and starts round 3pm until late. 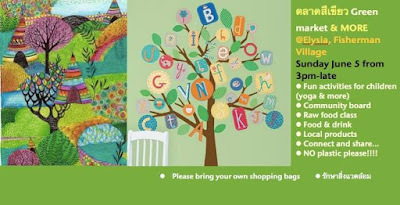 This edition will be very children friendly, even more than usual, so come and visit and bring the kids along. Great breads can be bought and lot of organic food and associated items will be for sale. Expect Sweet Sisters to be there along with plenty of other green food producers from around the island. Please bring your own shopping bag and just don't bring any plastic bags or plastic in general. Hope to see you there, it's well worth a visit and a great effort is put up by the organizers. 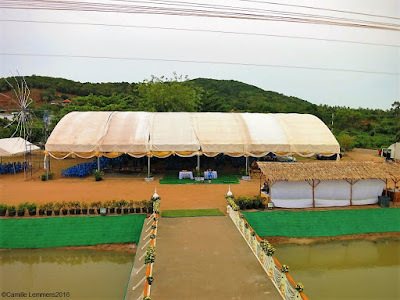 Let's make Koh Samui greener and more eco friendly and enjoy the organic food. Sadly enough it is thought that two tourists died when a speedboat capsized yesterday near Nathon at Laem Khai. The forecast is looking on the up, the wind should have fizzled out come Tuesday and the first appearance of the sun may be around, with more sunshine to come later next week. All in all the stormy weather was not as bad as initially predicted. 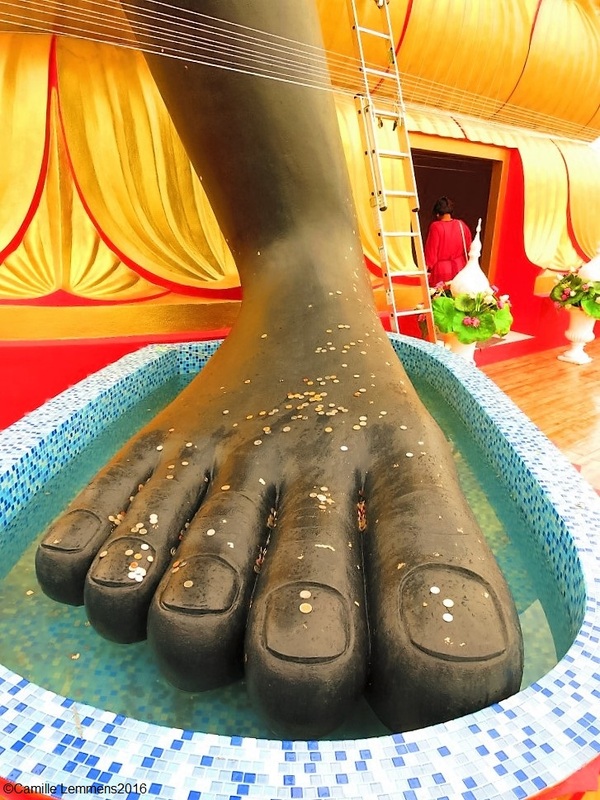 It's already two days ago the at Wat Bophud sitting monk statue ceremony happened. I've been too busy running around and doing other things to report about. But here we go now, I have found time to report about what I found and saw. Unfortunately we didn't see the placement of the monks 'heart' in to the statue, since I had to transfer my visa into my new passport at immigration office in Nathon. We just caught the very tail end of the ceremony, where the location of the heart was being cemented closed and painted black, just like the rest of the statue. It was a big event with many guests and locals alike and it's really a shame to have missed it. A real surprise for me was to find out that you can actually enter the boat or building. There's a small bridge over the water leading to the inside of the building and of course this had to be checked out. Once you enter there are a few items on display to revere the original monk and some Buddhist amulets were for sale. Since this ceremony went on for a couple of days, there were amulates dedictaed to each specific day. Than on the left, after entering, are stairs leading yu to the upper deck and you almost stumble into the sitting monk upon entering. On this deck there are plenty of Buddha statues on display, under a roof and you have a great, close up view of the monk statue and the temple behind you. Well worth a visit and good for some great pictures. Do stop by once you're in the neighbourhood for a visit, it's a unique building on Koh Samui and it's nice to see and possibly take some pictures. As already mentioned, well worth a visit and a nice Buddhist addition to the island's cultural heritage. The predicted storm wasn't as bad as expected after all. The forecast is looking a lot nicer again, still a fair bit of wind and cloudy skies should be expected until early June, when the weather is supposed to turn and the sun may come out again. Yesterday saw a cloudy and wet day. There was hoever no hard rain but it mostly drizzled all day long, with some dry periods inbetween. The wind played it's role as well but was not as strong as I expected from the predictions. Max temp dropped drastically to 29C, the first time this month below the thirthy degree treshold. We had two more powercuts which was rather annoying, atlhough thry didn't last as long this time, An hour and a half was the longest power cut, but it was between 9pm and 10.30pm. The forecast predicts the wind to slow slightly down after today with still plenty of cloud cover and plenty of rain or drizzle to come until 1st June. From this day on there may be a change in weather and the sun might come out again. Yesterday saw a mixed bag of weather types passing the scenery. We had an early morning shower shortly after 7am, followed by partially cloudy skies with plenty of sunshine and it was actualy warm, a lot warmer then I ever expected it to be. By 1.30am, we had a storm like wind gust followed by rain pass by and shortly after this, around 2.30am we had a power cut which lasted for ten hours, until 00.30am. It was mostly dry and the wind dropped again afte the storm like wind gust. Max temp still reached 34C due to the monring heat and sunshine. The forecast chanfed a little bit, the four day stretch of stormy wind gusts has been repalced by stormy wind gusts just for today. A little bit of rain is expected today and more tomorrow after which there should be a lul in rain downpour but the wind remains until 31st May with some rain showers. The first of June may see a drop in wind and rain only to pick up again on the second. The soup is never eaten as hot as when it's served it seems. There's still plenty of wind to come but the storm like conditions seem to have mostly gone. Smaller boat traffic will most likely be stopped for a couple of days but I see no problem for the bigger car ferries. The forecast predcits the stormy weather to hit as of tomorrow, actaully coming in already tonight, all the way down to Sunday, Expect cloudy skies, strong, storm like wind and plenty of rain. Tomorrow in a week it may start to slow down again and become slightly better again. The forecast hasn't changed much, the Samui Regatta which started yesterday couldn't have asked for more wind! As of tomorrow we should have storm like winds for four days in a row accompanied with plenty of rain. It's going to be interesting, with respect to flash slooding and powercuts around the island, plus any colleteral damage caused by the storm. Until the end of the month it should stay stormy and wet, time to pull up the hatches! 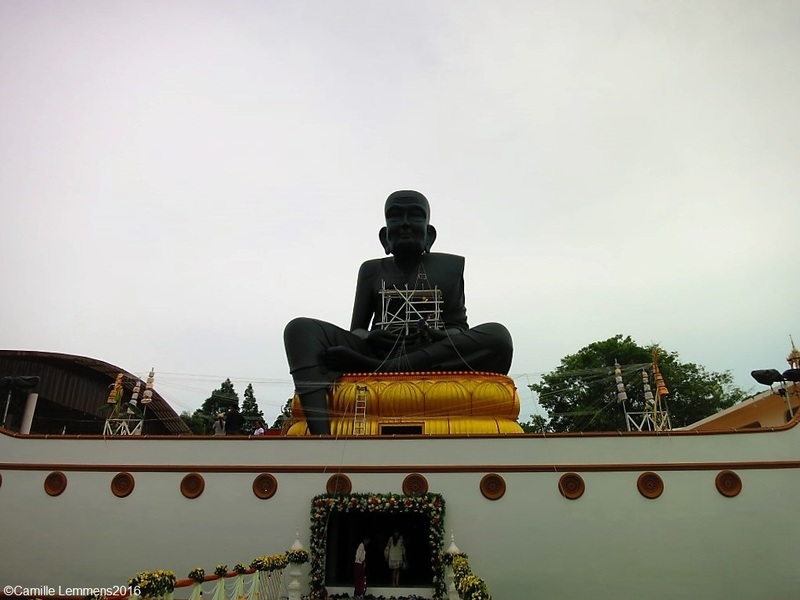 Yesterday saw Visakha Bucha Day 2016 around Thailand and since 1996, if a holiday falls on a weekend, the following working day is observed as a compensatory non-working day, subject to Thailand's Cabinet declarations. In other words, this years Visakha Bucha Day 2016 was on a Friday so no compensation day but a long weekend. This day commemorates the birth, enlightenment (nirvāna), and death (Parinirvāna) of Gautama Buddha in the Theravada or southern tradition and is celebrated outside of Thailand as well, among others in India, Sri Lanka, Nepal, Tibet, Bangladesh, Bhutan, Indonesia, Philippines, Singapore, Vietnam, Thailand, Cambodia, Laos, Malaysia and Myanmar and various other places around th eworld. 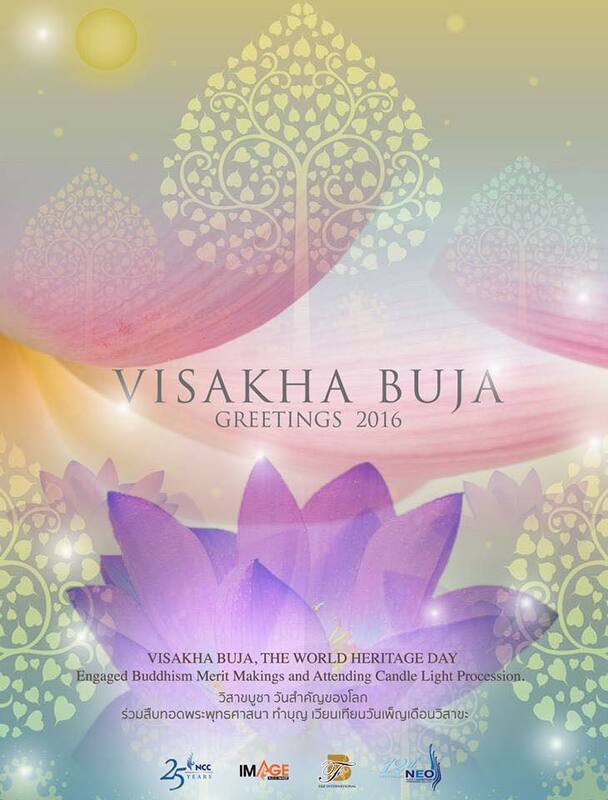 Buddhist celebrations like this typically are celebrated on the full moon day. This means that the Full Moon Party on Koh Phangan is not happening until today, like a couple of times per year. There was another wien tien at our local Wat Plai Laem, or walk around the temple, as part of the celebration. Today the Samui Regatta will start which is already in it's 15th season. The forecast hasn't changed that much now and the wind and rain are about to move in, Monday should be the start and storm like winds are about to visit Koh Samui until Wednesday accompanied with some heavy rain on Monday evening and most likely a constant rain before and after. Thursday the wind and the rain should ease up but it will still remain very cloudy. It looks like the end of May is going to be a bit rougher and wet. Today I'm off diving at Sail Rock, before the strong winds take over next week and some of the boat trips may be forced to cancel their services temporarily. Yesterday saw sunshine during the monring but clouds moved in during the afternoon and at some locations around the island it rained, albeit not on our part of the island, the North Eastern corner. Max temp still reached 34C, it felt very warm indeed. The forecast is changing subtly with the predicted strong wind and rain moving back a day, every day. It is possible that this may continue and we won't have a stormy couple of days but at this moment I think it's not very likely, but you never know. Right now heavy cloud layers will prevail for the next ten days but the strong wind is now not supposed to start until Monday and last until Thursday, accompanied with rain. After this stormy period, it should remain cloudy and windy with more rain to come. The forecast is not looking too good for the next ten days. The heatwave is about to get kicked out and as from Sunday strong winds may blow, sometimes even reaching storm like strengths, accompanied by heavy cloud cover and plenty of rain. A difference almost of day and night. It's fairly cloudy over Koh Samui this morning and it looks like most of the day will remain like this. Current temp at 7am is 28C but it already feels like 34C! 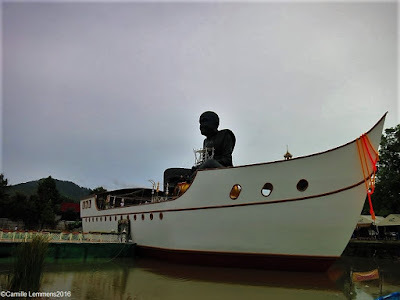 Yesterday saw a mostly cloudy sky over Koh Samui all day and it looked like it rained in the Western part of the island, when I arrived by ferry, there were wet roads and puddles on the road on that part of the island. Max temp reached the by now almost routine 34C. The forecast did change, big time this time around. It will remain like today for the next three days, including today. As from Saturday storm like wind is supposed to hit Koh Samui with ehavy cloud layers and plenty of rin. The heatwave is playing it's last hand over the next coming days and a different weather pattern will show up. An early update today since I want to hit the road back to Koh Samui as early as posible. The forecast has changed again and that change in weather coming in over the weekend is the culprit. Into the weekend it may be fairly cloudy at times with the chance of a quick and short tropical shower but come the weekend, heavy cloud layers are supposed to move in as of Tuesday a strong wind is around. Chances of rain are increased during this period. It looks like the current heatwave may come to end around or shortly after next weekend. On Phuket we had a very successful PADI IE yesterday for my candidates and they apssed all exams with flying colors. Today I will be diving again from the boat and teach some PADI Specialty instructor courses. Tomorrow it's back home to Koh Samui again. Yesterday saw another hot day around Koh Samui and the maxt temp reached 34C, still relentlessly warm each day with a relative high humidity. The forecast has changed slightly again and until next weekend we should see loads more of cloudy skies, specifically around and after next weekend. There's an odd change of a tropical shower, but nothing too serious and after next weekend we may see some strong wind for a day or two. The expected change of weather is happeniong but at very slow rate. The PADI IE on Phuket is in full swing and yesterday my candidates passed three out of four segments with flying colors and very high scores. Later this morning I will join them on Kata beach, where they currently are conducting their Open Water dive segment of said PADI IE. Yesterday saw once more a very warm day around Koh Samui with a max temp of 34C, the heatwave is holding on just a little bit longer. The forecast has changed again, slightly for the better. Until next weekend we have mixed cloudy days, sometimes a bit less, some days a bit more and an occasional tropical shower is possible. Come next weekend, heavy cloud layers move in and the wind might pick up and a greater change of showers but not as heavy as was predicted yesterday. It looks that slowly the heatwave is about to move on. The forecast has changed again a bit, until next weekend it's fairly to mostly cloudy but as of next weekend there should be a very strong wind, almost storm like, especially on Sunday but with currently a lot less predicted compared to yesterday's prediction. The hot temperatures are not about to drop though for the time being. On Phuket we completed the current May 2016 PADI IDC yesterday and the students are ready to tackle the PADI IE, starting tomorrow. 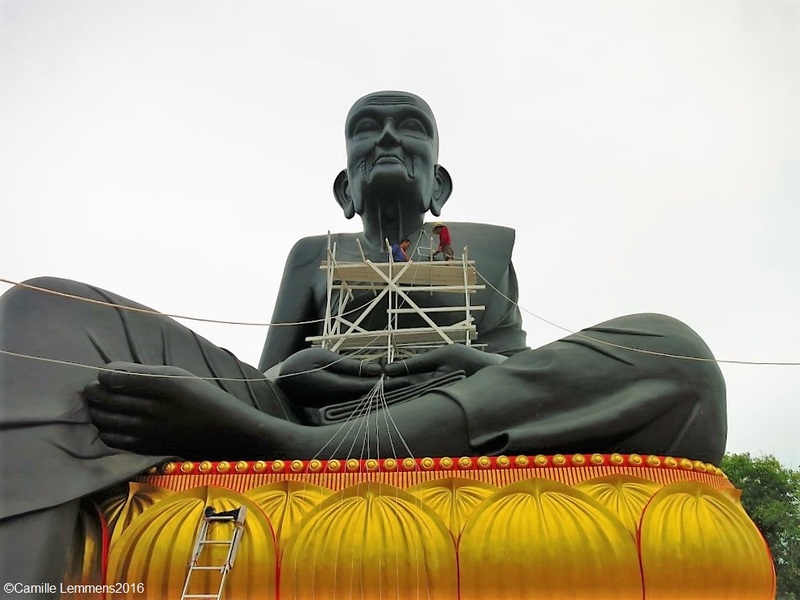 Can't wait to get back home to Koh Samui and see how the development of the sitting monk at Wat Bophud is progressing. This picture is from about three weeks ago. The forecast is about to change a little bit. Up to the weekend of the 21st May it's going to be fairly cloudy and we should be able to enjoy a nice breeze at times, but that weekend of the 21st a strong wind may come up and we might have some strong showers during that weekend as well. The forecast is predicting slightly cloudier days starting this weekend, still with a nice breeze at times and with a tropical shower possible as well. 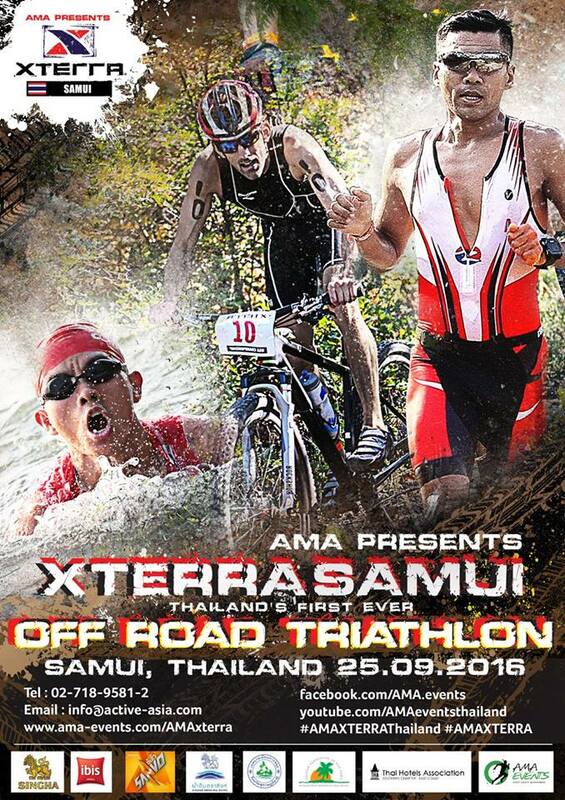 There has been a lot of talk about over a few years already but now at last it will happen; the X Terra Samui, Off Road Triathlon 25th September 2016 on Bophud beach by AMA Events. Just like the Ironman brand name for triathlons, the X Terra is the same well known brand name for off road triathlons. 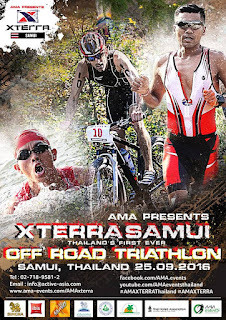 Koh Samui will be a great location for such an event and it will be an excellent addition to the islands sports calendar. Registration will open soon and information can be found on this website from AMA events. The reason today's update is late, is because I am just back form a field trip with all staff from PADI CDC 'Dive Asia' on Phuket and we went to Thanbok Khonaree national park in Krabi province. Yesterday saw once more a very hot day around Koh Samui with a max temp of 35C. That heatwave is not thinking of leaving just right now. The forecast for the next ten days has not changed a lot, mostly partially cloudy skies with at times a nice breeze and not much chance of a shower. It looks like it will stay hot for the a few more days or weeks. This morning I will set off on a company trip to Tanboke National Park water falls in Krabi province near Ao Leuk. Will be back again tomorrow afternoon and expect a late weather update. The forecast for the next ten days hasn't changed that much, it should be sunny and warm to hot until the weekend. Over the weekend heavy cloud layers may move in and maybe there will be a tropical shower but not a lot of rain. Temperatures are expected to remain stable. Evening snacks in Kata on Phuket, all kinds of barbecued food on sticks or some dried squid, a prime sample of food on wheels! For the next ten days we should have a light breeze at times, mostly partially cloudy skies and occasionally some heavier clouds moving in. It looks like the 15th Samui Regatta that is scheduled to start the 21st May, may end up with some nice breeze or wind.